Elias Hartvigsson is a new postdoc at the division of Energy technology. 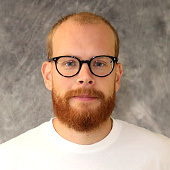 He received his PhD from Chalmers in 2018 working on dynamics in rural electrification in collaboration with Berkeley Lab and Politecnico di Milano. His current research focus on the intersection between electric power systems and long-term trends in the area of variable renewable energy. Specifically he works on the impact of infrastructure investments and their connection with the share of variable renewable energy sources in electric power systems. There might be more projects where Elias Hartvigsson participates, but you have to be logged in as a Chalmers employee to see them.